Want to be a character in Book 3? 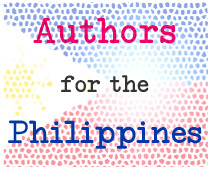 I’m very honoured to take part in the Authors for the Philippines initiative that’s been put together by a few hard working YA authors. The site can be found by clicking the bolded link above, and the link to what it’s about is over here. So, this is your chance to get your name into The Blackhart Legacy for a great cause. The link to my bit of auction can be found here, but do go and have a look at what else is on offer. Tonnes of swag, signed books, manuscript critiques and all manner of things can be snagged if you’re the highest bidder. I’ve bid on a signed (and dedicated) hard back copy of Candy Gourlay’s new novel: SHINE. And I’m pretty sure I’ll be bidding on more as more items will keep on being added as the word spreads and more authors, editors and agents hear about it. So, do please tweet about it, Facebook about it, tell your friends about it the initiative and lets help friends we’ve yet to meet who live on the other side of the world. The madness only gets madder!